Were you known as the cute, “freckle-faced kid” in school? While you may have loved your freckles then, now, maybe not so much. Freckles are common in sun exposed skin and typically tend to be hereditary, especially in those with fairer skin types. For many, they appear in childhood and last a lifetime, but did you know there are ways to get rid of your freckles? That’s right, you don’t have to live with them if you don’t want to! They are caused by very small groups of pigmented cells containing melanin near the skin’s surface. The face, shoulders, arms and back are typically places you see them, but they can randomly pop up anywhere that’s sun exposed for some people. They aren’t dangerous, and because they are a pigment problem of the skin, they can be treated and removed with lasers that break up pigment. Q-switch lasers are an example of this type of laser. Highly effective and FDA-approved, these devices can help remove freckles and give you back the even, natural skin tone you were born with. These lasers are also frequently used for tattoo, birthmark and sunspot removal. They are safe and really have no downtime. They work by delivering an energy shockwave to the pigment cells which breaks them up into smaller pieces that your body clears away naturally. Usually, freckles can be removed over a series of treatments (same with tattoos, birthmarks and sunspots) depending on how many and how extensive they are. If you are looking to get rid of freckles and wrinkles at the same time, all in one treatment, then you may want to consider a laser resurfacing treatment with an erbium laser. This is a bit more powerful procedure that removes damaged or pigmented skin in addition to stimulating more collagen production. Because of this, there is some downtime after the procedure, but it is a great option if you’ve got sun damage and wrinkles in addition to your freckles that you want to treat. 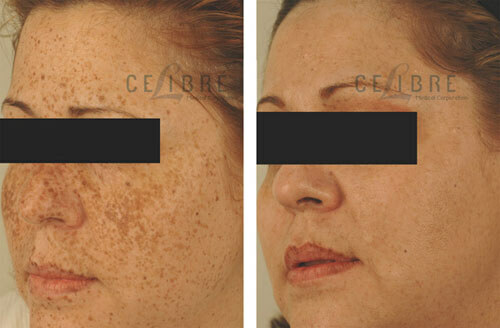 Celibre Medical Corporation has over 30 years of experience in using medical lasers to treat a wide range of skin conditions. Give us a call today and let us take a look at you to talk to you about how our state-of-the-art technology and expert practitioners can get you on the road to clearer, brighter skin. Contact us today to schedule a FREE laser freckle removal consultation!